LONDON, England (CNN) -- Lloyds Banking Group saw its share price tumbled Friday after reporting worse-than-expected profits for its subsidiary HBOS. Although Lloyds TSB has seen a pre-tax rise in profits, HBOS is expected to register a loss. Shares for the UK-based banking group tumbled almost 35 per cent by the close of London trading Friday, Reuters.com reported. The Lloyds Banking Group, formed following the merger between HBOS and Lloyds TSB, began trading for the first time last month. Lloyds TSB traded "satisfactorily" in 2008 and is expected to report a pre-tax profit of around £1.3 billion ($1.9 billion) , Lloyds Banking Group said in a statement Friday. But HBOS is expected to report an underlying loss of an estimated £8.4 billion ($12.1 billion) last year -- much of it lost through exposure to the meltdown in the property and credit markets. The HBOS sum is some £1.6 billion ($2.3 billion) higher than the bank forecast to shareholders last November, the statement continued. The UK government took a stake in both HBOS and Lloyds TSB last October as part of the bailout of banks hit by toxic debt. Eric Daniels, Group Chief Executive, Lloyds Banking Group, said in a statement Friday that HBOS's trading had been "further impacted by increasingly difficult market conditions" since a statement on December 12, including "an acceleration in the deterioration of credit quality and falls in estimated asset values. "HBOS's 2008 results have been adversely affected by the impact of market dislocation, which accelerated significantly in the last quarter of 2008, and the additional impairments required on the HBOS corporate lending portfolios," Daniels continued. "These impairments primarily reflect the application of a more conservative recognition of risk and the further deterioration in the economic environment. "Whilst we recognise that the short term outlook is more challenging, Lloyds Banking Group has the largest UK financial services franchise, with excellent long-term earnings potential. Daniels added that the group is already making good progress on its merger, which the UK Press Association previously reported would result in annual savings of at least £1.5 billion by the end of 2011. 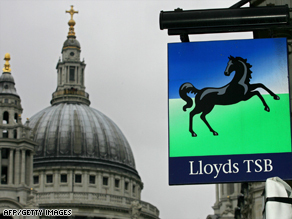 Lloyds Banking Group has an estimated 145,000 staff and 3,000 branches in the UK. The group will next provide an update on February 27.